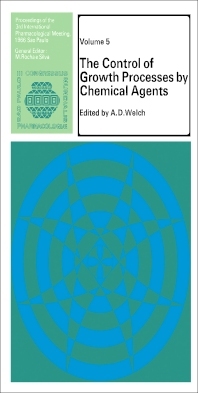 The Control of Growth Processes by Chemical Agents covers the proceedings of the 1966 Third International Pharmacological Meeting on Control of Growth Processes by Chemical Agents, held in Sao Paolo, Brazil. This book is composed of seven chapters, and begins with a survey of the comparative biology of dihydrofolate reductases as a basis for chemotherapy. The succeeding chapters deal with the mechanism of pyrimidine metabolism as a chemotherapeutic target and the biochemical and biological research works with arabinoforanosyl cytosine, known as cytarabine. These chapters specifically describe the cytotoxicity and antitumor activity of cytarabine. The remaining chapters discuss the advances in viral chemotherapy and the regulatory mechanisms of enzyme synthesis and their alteration in malignancy. This book will be of value to biologists, biochemists, and oncologists.